The 9th edition of ArtVilnius art fair, taking place from June 7th to 10th, is focusing on the Baltic States. 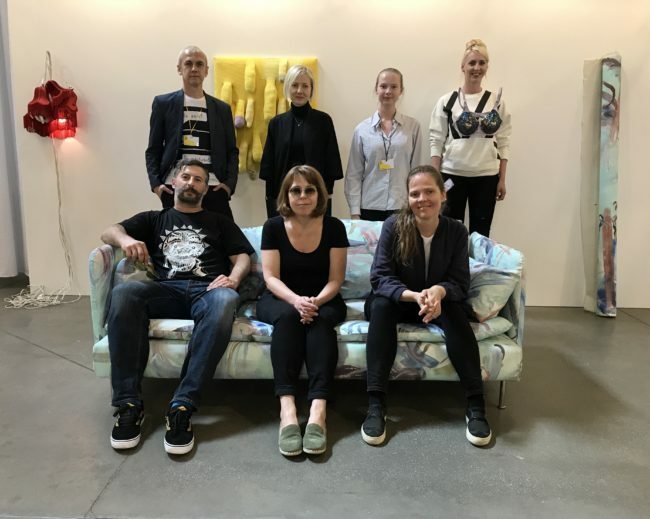 The Estonian Contemporary Art Development Center is coordinating the largest participation of Estonian galleries and artists in a contemporary art fair. In 2017 ArtVilnius was visited by 22 500 visitors, which is the current record, making it the largest art fair in the region. This year, there will be 55 projects with 200 artists from 20 different countries participating in the fair. Avangard Gallery presents a two-part exposition at the fair, the first of which will take a look at contemporary art (by Leonhard Lapin, Raul Meel) that was condemned during the Soviet era. This will be juxtaposed with the socially-critical art (by Peeter Allik, Andrus Joonas) born of a free society, which is no longer hampered by directives, prohibitions, or taboos. Gallery Positiiv will be showing photographic works by Eve Kiiler, Vivian Ainsalu and Meeli Laidvee. Kiiler is exploring urban landscapes in her home town Tallinn and other cities in the Baltic States, Ainsalu finds inspiration in the melancholy of Estonian nature, and Laidvee is interested in the human body and telling stories through it. Foku will be participating with a project by Laura Kuusk. Kuusk has studied semiotics and fine art photography. Her works can be described as studies of standardisation, rationality, and justification. In her recent works she has started investigating the “copy-paste culture” – an everyday reality we are all part of which is producing more uniformity. Haus Gallery will present Maarit Murka’s paintings from series ‘Out of Context’ and ‘Mindroom,’ as well as her new graphic series ‘Welcome to.’ Maarit Murka is mostly known as a hyperrealist painter; however, this time she is taking a step back and exhibiting part of a creative process that typically isn’t exposed. NOAR will participate with a two-part display: the first consists of works by the winner of the Baltic Young Artist Award 2017, Katrīna Čemme, and the second is an exposition of the best works from the ‘MyEstonia?’ competition. ‘MyEstonia?’ offers reflections on Estonia through the eyes of foreigners. In addition, NOAR will present the travelling project ‘(Re)start Reality’ by the mystical street artist Edward von Lõngus. Okapi Gallery will be presenting Mexican performance artist Niña Yhared at this year’s ArtVilnius. Last year, Niña Yhared defended her doctoral thesis at the Universidad Nacional Autónoma de México, in which she addressed the cultural, political, physical, and psychological borders of being a woman by using her own body. The display at ArtVilnius consists of a photographic series, an audio-visual work, and a performance by Yhared. Kogo Gallery will show very recent works by Elīna Vītola, Alexei Gordini, and Eva Mustonen. Vitola has studied painting and has a rather conceptual approach to painting and colors. Gordin’s background is also in painting, but he fluently uses different media and works with drawing, photography, video, and performance. Mustonen currently works mainly as an installation artist, with personal narratives being the dominating aspect of her projects. A solo project ‘Sit Back, Relax and Enjoy the Rest of Your Life’ by Marko Mäetamm will also be presented, inspired by the daily life of the artist and, most of all, by the feeling of uncertainty. Uncertainty is a condition that has become a solid part of our everyday lives and we have gotten used to it. Mäetamm’s installation consists of drawings, animation, and a sculptural object. ArtVilnius will be held at the Lithuanian Exhibition and Congress Centre LITEXPO (Laisvės ave 5, Vilnius). The participation of Estonian galleries and artists in Vilnius is supported by the European Regional Development Fund and the Estonian Contemporary Art Development Center.